If you are a collector of vintage high-end audio equipment, chances are you owned a reel-to-reel tape player. I remember back in the 1970s that anybody wanting to call himself an audiophile had better own a rack-mounted reel-to-reel player. Of course the funny part is that many of those people could not afford to buy original recordings on tape, so they would dub from an LP on a turntable or from a cassette or, gasp, 8-track tape. 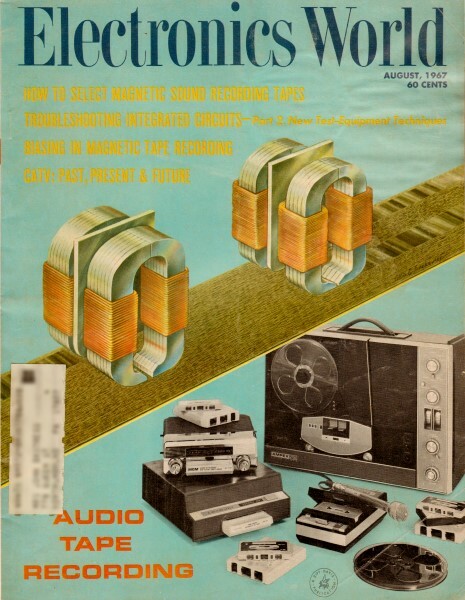 This article from the August 1967 edition of Electronics World delves into the technical aspects of magnetic tape, daring to introduce such terms as intrinsic cohesive force, residual induction, and flux - heavy stuff for the layman. Of course, regurgitating such terms while wowing their friends with a rolling tape held to keep the subject off of whether the music being played on a $1000 reel-to-reel player had been dubbed from a $75 cassette deck. The tape user looks at magnetic tape in terms of its electrical performance on the recorder, expecting a certain frequency response or a specified signal-to-noise ratio. The tape maker must translate these requirements into magnetic properties which, when present in the tape, will assure the specified machine performance. Since magnetism is the operating principle in tape recording, it follows that the magnetic properties determine the electrical performance of the tape. The chemical and physical attributes have a very pronounced effect on the magnetic behavior of the tape, but their main role is to assure the best possible magnetic characteristics for a given purpose. Most tape makers design and predict the electrical performance of their products by controlling the magnetic properties throughout the manufacturing process. This control is exercised predominantly prior to the actual coating operation, because after this point the tape is largely finished and little can be done to correct any faults. The knowledge of the valid relationship between magnetic and electrical properties is, therefore, of vital importance to the manufacturer, but it should be of value to the user as well to enable him to utilize this medium more effectively. It appears worthwhile to describe briefly some of these relationships, to help the reader in forming a clearer picture as to what the tape manufacturer is doing and what parameters he is manipulating to make the tape better. It must be understood, however. that this coverage is necessarily incomplete and greatly simplified; it is meant only to establish a few rules of thumb. 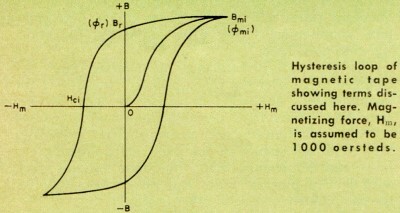 The figure shows a typical hysteresis loop of a magnetic tape. The symbols indicated are the ones usually listed in technical data sheets and other tape literature and are, therefore, quite appropriate to this discussion. Most data sheets specify the magnetic characteristics at a fixed magnetizing force. Hm, of 1000 oersteds. For all practical purposes, a force of 1000 oersteds is sufficient to saturate the majority of magnetic tapes. By strict definition, however, saturation is not reached until the tapes are subjected to several thousand oersteds. For this reason, the symbols shown in the figure lock the sub-index "s" which would denote saturation. For instance. Br (residual induction) is used here instead of Brs (retentivity); Bmi (maximum intrinsic induction) is shown instead of Bs (saturation induction). Many tape data sheets do not make this distinction and employ the saturation symbols and terminology with the tacit assumption that 1000 oersteds is indeed Hs (magnetizing force high enough to produce saturation). These side remarks may prove helpful in clearing up seeming inconsistencies among various data sheets and specifications. In addition to defining the resistance to demagnetization or erasure Hci also determines the tape's resistance to magnetization or recording. Accordingly. a higher Hci tape, when compared to an otherwise identical tape but having lower Hci, will require a higher bias and record current for equal output and distortion. Nearly all magnetic tapes utilizing gamma ferric iron oxide as the active ingredient fall within the range from 230 to 330 oersteds, with 250-270 being most common (at Hm of 1000 oersteds). Given the impetus by modern instrumentation and computer tapes which put high-frequency response and resolution as the major requirements, the industry is moving slowly but inexorably toward higher Hci tapes. High coercive force tapes, 400 to 600 oersteds, are around the corner for the more exotic tapes, but it will be some time before they are used in audio work. The second magnetic characteristic to be considered is Br (residual induction or flux density) measured in gausses. Br is a calculated value obtained from the expression, Br = Φr/A, where Φr is the residual flux, measured in maxwells, and A is the tape cross-sectional area in cm2. Cross-section is the product of tape width and coating thickness. Φr is directly proportional to the tape width and thickness, at a constant Br. To put it another way, the same Φr may be achieved with half the thickness, but doubling the Br for the same width. Φr determines the amount of magnetization remaining in the tape after the magnetizing force has been removed. Φr thus establishes the magnitude of the playback output. Br on the other hand, defines the coating thickness necessary to achieve the required Φr. In very general terms, the output at long wavelengths - within the limits of the 6 dB per octave unequalized playback slope - will increase with Φr, providing the record head is capable of biasing the entire thickness. An increase of thickness and, consequently, of Φr, beyond this point will not raise the output any further. A tape with a higher Br though would allow for an increase of Φr with no change in thickness and thus result in an increased output. In short wavelength recording - starting beyond the peak on the unequalized playback curve - the surface of the coating nearest to the head produces most of the output. The contribution to the output of the layers farther away from the head diminish with decreasing wavelengths. The short wavelength output therefore depends on the Φr of the top layer of the coating. It is clear then that increasing the Φr by a thicker coating is useless and will not improve the high-frequency output. The solution is to raise the Φr within the active layer, which may be accomplished only by a higher Br. These examples illustrate that high Br is generally advantageous in sound recording, especially if a full frequency spectrum is to be recorded at slow speeds. Unlike Φr, however, which may be changed pretty much at will simply by varying the coating thickness, Br is subject to more limitations. Br is limited by the available induction of iron oxide, oxide concentration in the coating, coating density, and magnetic losses. Present tapes run from about 700-1400 gausses, the most common ranging from 800-1100 gausses. Φr of the present tape ranges from about 0.2 to 1.2 maxwells per 1/4-inch width, with 0.6 maxwell being typical. Bmi (maximum intrinsic induction) and Φmi (maximum intrinsic flux) have the same units and are derived in the same way as Br or Φr. As the figure shows, they denote the maximum value of flux or induction while the magnetizing force of 1000 oersteds is applied to the tape. This property is an important control parameter for the tape manufacturer, but of little use per se to the sound recordist. When compared with Br however, it yields squareness is the result. Squareness, as it is commonly but not quite correctly called, is the ratio Br/Bmi or the numerically equivalent Φr/Φmi. Since Bmi is determined while the magnetizing force is applied, the demagnetizing losses are zero. Br is determined at zero force where the demagnetizing losses are maximum. The ratio of these two properties is thus a measure of the internal losses in the coating. These may be caused by a variety of reasons including faulty dispersion, poor quality or damaged oxide particles, wide distribution of particle shapes, insufficient orientation, and other factors. Some tape manufacturers have special tests to determine the exact cause of low squareness, but they cannot be discussed here. The range of squareness in current tapes is from 0.63 to 0.82 (at 1000 oersteds) the typical being about 0.76. Since the ideal squareness is 1, the 0.76 indicates a demagnetizing loss of 24% resulting in a corresponding loss in Br. Values ranging from 0.85 to 0.93 have been achieved in laboratories. Squareness is important not only because of its direct influence on Br but even more so by its effect on output losses caused by self demagnetization by the signal itself. This effect is closely related to the accidental demagnetization mentioned previously in connection with Hci. 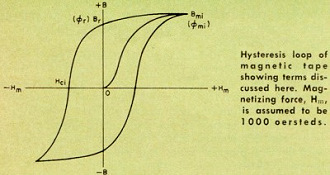 These two parameters, squareness and Hci, must be considered together as the interaction between them can either offset or multiply the individual effects. The matter of interrelation among the different properties is worthy of special emphasis. These interrelations are often quite complex and could lead to wrong conclusions if considered without sufficient data or without the necessary experience. Readers are advised, therefore, to be cautious in making decisions about tape quality on the sale basis of the magnetic properties as listed in tape data sheets. The rules of thumb presented here are very useful but tell only part of the story.